SEE! Olga’s head (prop used in TURKISH DELIGHT) SEE! A ‘Tippi’ Hedren signed pigeon (prop used in THE BIRDS) WALK PAST! A corridor long cabinet filled with posters from Alfred Hitchcock, Bertrand Tavernier and Fons Rademakers films.SEE! 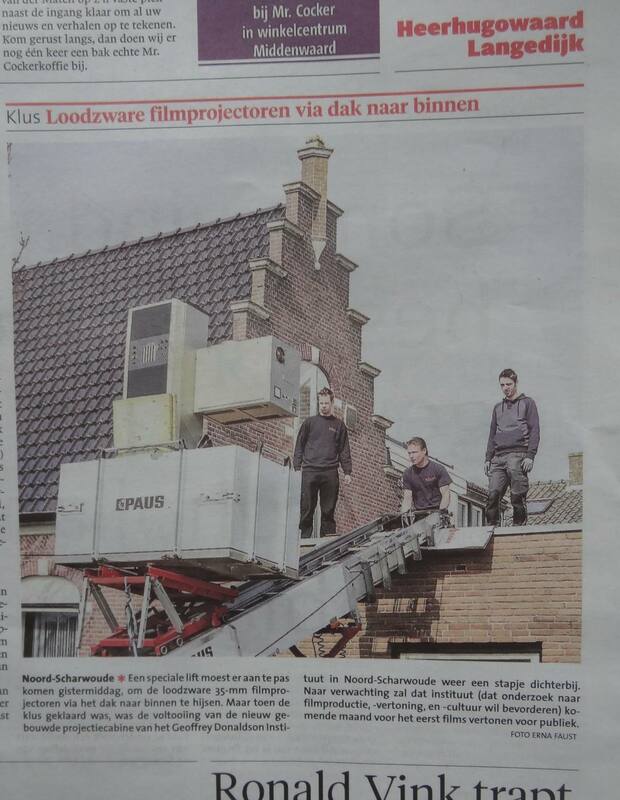 Talk of the Town/Spraakmakende Film Makers. 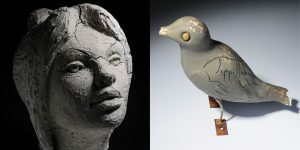 Exhibition in the Geoffrey Donald Institute, last two weeks, closing April 6, 2019. 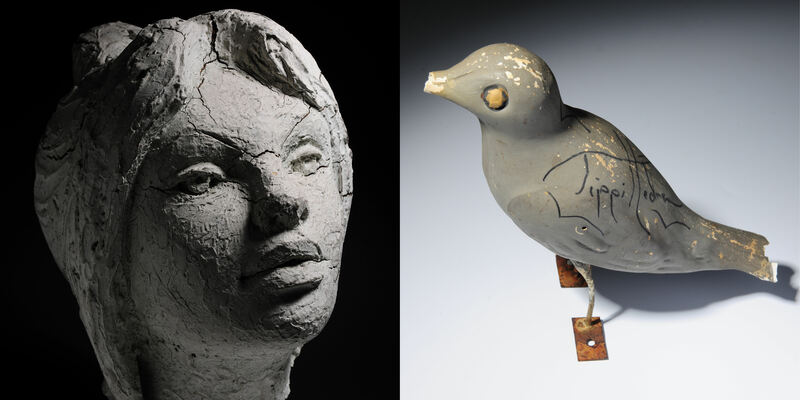 Starting from the 9th of December, the Geoffrey Donaldson Institute presents the exhibition Tot de laatste akte! (Until the last reel!). 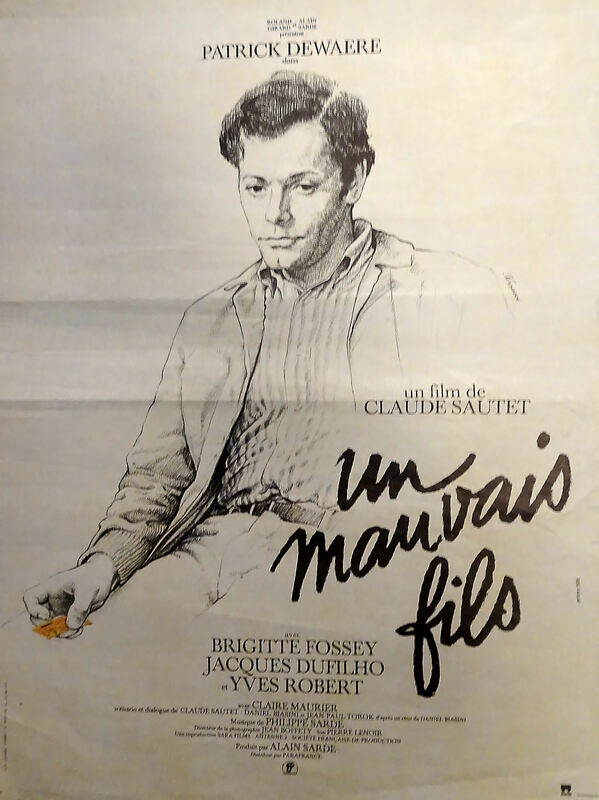 With this exhibition, the film institute in Noord-Scharwoude puts a spotlight on a special group of film lovers: the passionate private collectors of 16mm and 35mm film. There are about fifty of these collectors left in The Netherlands; it’s a small world. Captivated by the magic of analogue film, they have saved countless films, projectors, posters, photographs and documentation from destruction. The medium has not only been under threat from vinegar syndrome and fire risk, but also from the distributors themselves. For years, it was the norm in The Netherlands to destroy (‘chop’) the films after their cinema run. 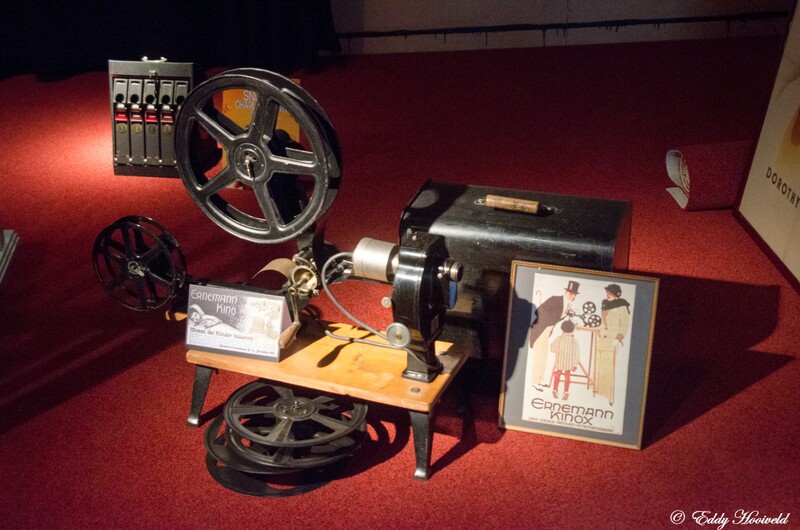 Since the digitalisation of all Dutch film theatres and cinemas in 2012, the importance of their collections has therefore only increased. The extraordinary collections of these private collectors will be shown to a large audience for the first time by the GDI. Numerous objects will be on display at the exhibition: cameras, projectors, photographs, articles and of course – especially – film. The exhibition will be accompanied by the book Tot de laatste akte! 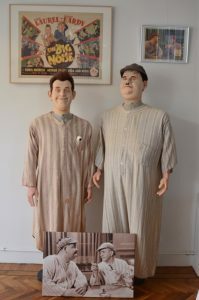 Film journalist Barend de Voogd was asked by GDI to interview nineteen private collectors about their life stories and their unique relationship with film. Photographer Marjolein Ansink caught the collectors in pictures. The exhibition Tot de laatste akte! is open on Monday, Wednesday and Saturday, from 2 p.m. until 5 p.m., and entrance is free. The GDI is closed from Christmas day until Tuesday, the 2nd of January, 2018. The book can be ordered for € 29,90 (plus and additional € 8,30 for shipping), from info@donaldsoninstituut.nl and will be for sale at the GDI. The GDI is located at Dorpsstraat 612 in Noord-Scharwoude. ‘Everything breathes CINEMA here’ commented Gerda Peters on her first visit tot the GDI last Sunday. 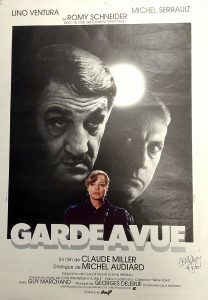 Gerda is the wife of film lecturer and festival programmer Harry Peters who will be donating his massive documentation archive to GDI later in the year. 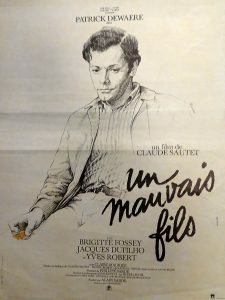 Upon their visit last Sunday, they already brought Harry’s extensive collection of film posters designed by the French Maitre de l’Affiche René Ferracci (1927-1982). Among these a copy of GARDE A VUE signed by Ferracci shortly before his demise. 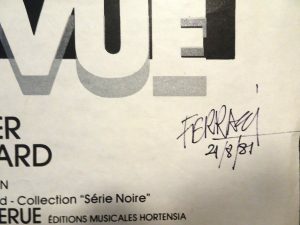 Together with the Ferracci posters already in our collection we now have some 200 of the approximately 1200 film poster Ferracci designed in his life. Last Friday in Noord-Scharwoude, the Geoffrey Donaldson Institute (GDI) shot scenes for a short movie. A professional film crew filmed on the corner near the building that houses the GDI. Filming took place on the Dorpsstraat, in front of the Primera shop and in the vicinity of the Jacob Jong bridge across the Achterburggracht. 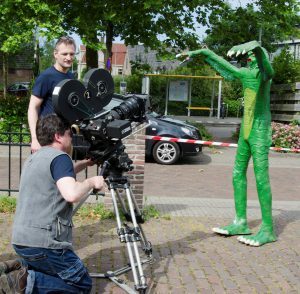 The movie stars ‘Green Man’ Jan Jansen who has not been heard of since his last scenes were shot on Friday evening. On Friday morning 15th July, twenty people gathered in the GDI to make a short film. Among them, actresses, actors and the film crew. It took a great deal of preparation and waiting, but director Emiel de Jong is very happy with the sets and the performances given by the actors. 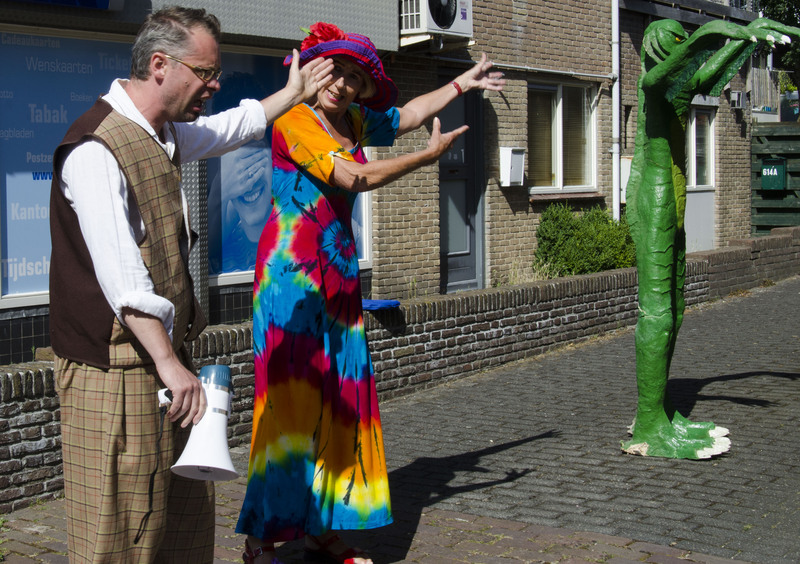 The film, entitled ‘The Creature from under the Bridge’, is expected to premiere on 25 September during the ‘Verhalen Halen’ event in Langedijk. Egbert Barten says of the film: ‘This short movie is what is referred to in the film world as a spoof, a parody of – in this case – fifties horror flicks’. The Green Man – who stands more than two metres tall – is inspired by the fifties classic ‘Creature from the Black Lagoon’ – an ominous fantasy figure created by the Groningen sculptor F.G. Windt in 1985. The Green Man was last seen on Friday night in the water beneath the Jacob Jong bridge on the Willem de Zwijgerstraat. The film stars various people from Noord-Scharwoude, including Joyce Wouters as the investigator, Jos Kreuk as the professor, Hennie Neesen and Marjan Glas as the camping scientists, Jeroen Haesenbos and Maarten Neesen as waiters, Rick Ooteman as a stormtrooper, Leo Glas as Elvis Presley and Bart Vermeer from Belgium as the director. 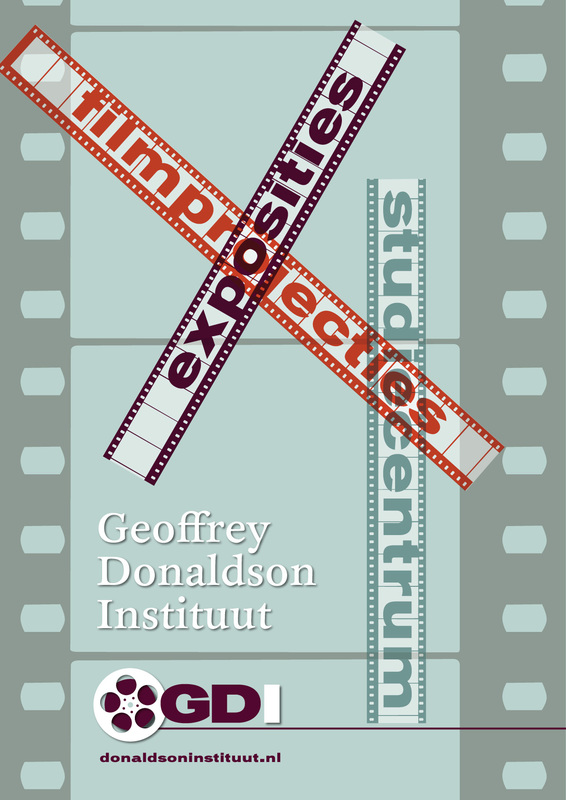 The GDI promotes research into film production and screenings and manages an extensive collection of films. 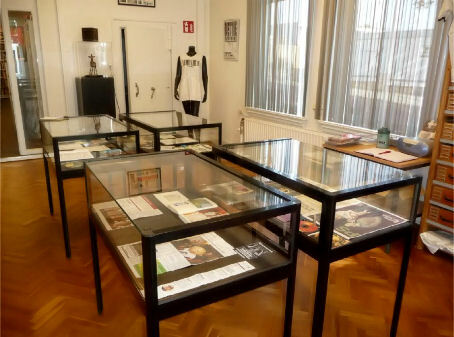 The exhibition space of the GDI is open to visitors every Monday and Wednesday between 14.00 and 17.00 hrs and entry is free. Other times can be arranged by appointment. 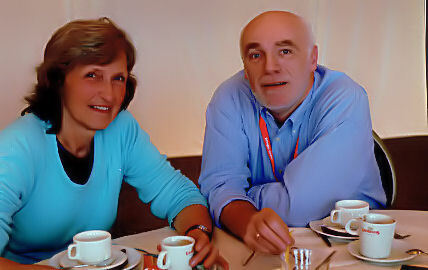 The Geoffrey Donaldson Institute operates out of Dorpsstraat 612 in Noord-Scharwoude. The GDI is a private initiative with no government subsidy. From the 20th of August the new exhibition Laurel and Hardy in Europe is on display.